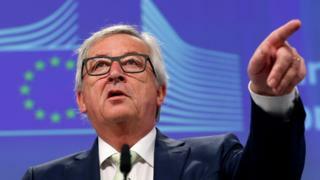 European Commission head Jean-Claude Juncker stressed the "Union of the remaining 27 members will continue". The UK voted by 52% to 48% to leave the EU, and David Cameron has announced he will step down as PM by October. He has said it will be up to the new PM to invoke the article that will begin the UK's withdrawal. Global stock markets fell heavily on the news of the so-called "Brexit". The value of the pound has also fallen dramatically. A meeting of 27 EU leaders has been scheduled for Wednesday to discuss Brexit - but Mr Cameron is not invited. Later, Mr Schulz criticised the decision by Mr Cameron and his divided Conservative party to hold the vote. "The European Union as a whole was taken as a hostage by a party internal fight of the Tories," he said. "And I'm not satisfied today to listen that he wants to step down only in October and once more everything is put on hold until the Tories have decided about the next prime minister." The sense of shock is palpable. EU leaders are struggling to come to terms with a huge setback for those who believe in the idea of European unity. The EU will never be the same again without the UK. It is also clear the leaders want negotiations on a political and economic divorce to move swiftly. That means they want the UK to invoke Article 50 of the Lisbon treaty - the mechanism under which separation will be negotiated - as soon as next week, rather than wait for a new British prime minister in October. In other words, tensions are already coming to the surface. And even though all sides are emphasising the need for co-operation, in many capitals there will be little appetite for doing the UK any favours. Europe's political order has been overturned - with far-reaching consequences that no-one can accurately predict. The UK must now invoke Article 50 of the Lisbon Treaty to leave, which then allows for two years for withdrawal to be negotiated. German Chancellor Angela Merkel expressed "great regret" at the British decision, saying: "This is a blow to Europe and to the European unification process"
Mr Hollande said the vote "seriously puts Europe to the test", adding: "I respect this painful choice. France will continue to work with this friendly country"
Some EU politicians fear a domino effect from Brexit that could threaten the whole organisation. Polish President Andrzej Duda said everything possible must be done to prevent other countries leaving. Leaders of Eurosceptic parties in France, the Netherlands and Italy quickly demanded referendums in their own countries. Reacting to the vote, UK Independence Party leader Nigel Farage said "the EU is dying". But Mr Tusk said this was "not a moment for hysterical reactions". Although many EU leaders expressed shock and dismay at the vote, they also urged solidarity and some stressed the need for change. Estonian Prime Minister Taavi Roivas said: "We must... work hard so that we do not lose the unity of the European Union"
Portuguese President Marcelo Rebelo de Sousa said "the European project remains valid to defend the values that mark our common identity"
Czech PM Bohuslav Sobotka said: "Despite the disappointment many of us feel... we must realise that this is not the end of the world and it's absolutely not the end of the EU"
Greek PM Alexis Tsipras said the vote was "either a wake-up call or the beginning of a dangerous path", adding: "We urgently need a new vision and beginning for a united Europe"